Monday - Sunday: 09:00 - 22:00. Last admission: 18:00. If you enter the baths by 18:00 you can stay until 22:00 and it's usually fairly quiet! We are comparing Szechenyi Spa Full-day Skip the Line Pass Prices from leading ticket suppliers and Try to find you Cheap tickets prices on the market. 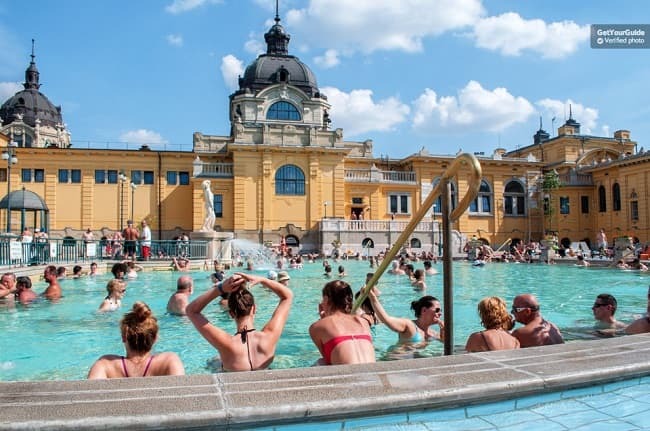 Széchenyi Bath is a thermal spa made up of three outdoor pools and 15 indoor pools. The spa sits inside City Park, the largest green space in Budapest. The baths boast a neo-baroque style, were built in 1913 and are the largest baths in Europe! The baths used to be private until 1927 when they were expanded and opened to the public. Temperatures inside the pools range from 20 degrees Celsius to 40 degrees Celsius. The thermal springs that feed the baths are actually some of the oldest and warmest springs in the city. Historically thermal baths were used by the romans for their health benefits but they also link to the Turkish. On this full day spa pass you’ll have efficient access to the spa by skipping the queue. Once inside simply relax in the thermal pools. Great for those looking to unwind. Your Experience With Szechenyi Spa Full-day Skip the Line Pass? Skip the line and head straight into the Szechenyi Spa. Sit back and relax at Europe’s largest thermal spring baths. Take your pick from any of the 15 indoor thermal pools or the three outdoor pools. Enjoy a hot water back massage in the outdoor pool. Head over to the Jacuzzi, whirlpool and hot tub for some ultimate relaxation. Admire the buildings baroque architecture. Float around in the hot pools in the 74 degree celcius water. What Szechenyi Spa Full-day Skip the Line Pass Includes? If you've forgotten your towel, swimsuit or flip flops, don't worry they can be purchased from the spa. Travelers Reviews about Szechenyi Spa Full-day Skip the Line Pass? The Szechenyi Spa Full-Day Pass has earned over 22,198 reviews and a 4 star rating on TripAdvisor. Tickets booked through Get Your Guide or Tiqets can be cancelled for a full refund 24 hours in advance. Tickets booked through Viator can be cancelled for a full refund 7 days in advance. The pools are undergoing a little renovation at the minute so be sure to check online before you book. Szechenyi Spa, Budapest, Állatkerti krt. 9-11, 1146 Hungary.